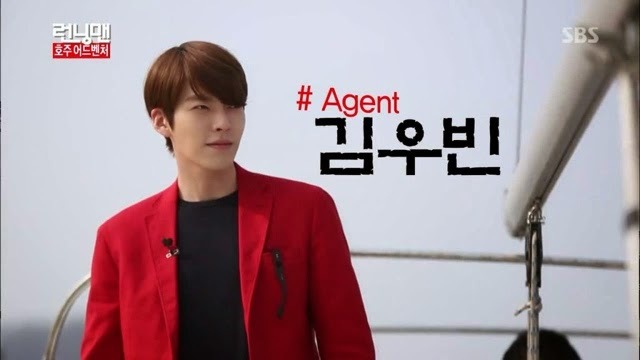 Our first Agent is Kim Woo Bin who acted in the Drama - The Heirs. 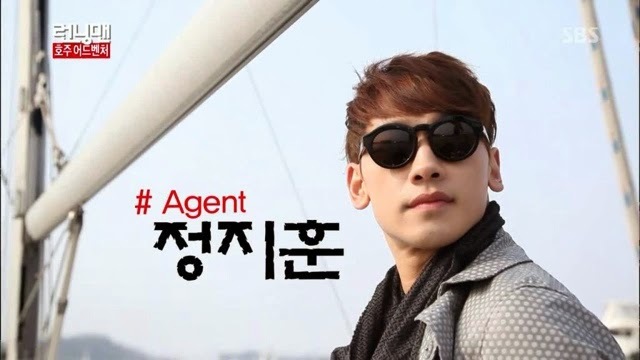 The second Agent is Korean international star - Rain (Bi). They were divided into different teams. Rain/Kwang Soo, Haha/Jong Kook, Woo Bin/JaeSuk and Suk Jin/Gary. Welcome to Australia! Song Ji Hyo was busy filming Emergency Couple and will only appear in the next episode. The PDs announced their mission is to find the lost treasure chest by gathering the four elements: Fire, Water, Earth, Wind. All of them chose a card and off we goes to the destination. The teams took the helicopters to arrived at the destination: Brisbane seashore. Their mission is to dive into the sea, search for the right key to open the treasure box under the ship wreckage. Kim Jong Kook and Haha hop on the ATVs to drive to the ship wreckage. Soon, Rain overtake them and took the lead. Rain is a good diver and he took as many keys as he could under the water. On the other hand, the only team that was struggling hard is Gary/Ji Suk Jin team. Ji Suk Jin lacks of stamina and Gary had to complete the mission solely by himself. Rain and Kwang Soo won the race and took a boat and travel back to the shore. Won Bin and Jae Suk finished second, followed by Haha and Jong Kook. It is hard to tell if Jong Kook used his strength to open the treasure chest. Anyway, we were left with the last team Gary and Ji Suk Jin. Eventually, after many dives, Gary managed to open the treasure chest and grab the list for their next mission. The first two winner teams can ask questions about the card which they choose. They have to travel back by helicopter again. We can see their astonished expression when they heard the instruction from the PDs. They were send off to the wildlife statuary and their next mission is jump over a combined of 3 metres. Soon, all of them dressed up in adorable Kangaroo costumes. Won Bin look cute with his sunglasses. Rain attempts to jump 1.8 metres but failed. After several tries, Won Bin and Jae Suk completed the high jump first. Followed by Kwang Soo and Rain. They were told by the Zoo keeper to feed the kangaroo next. Jae Suk looked worried as he talked about his fear of Kangaroo having watched videos about them. Eventually their mission was carried out smoothly and the Kangaroos actually fed on the food in their hands. Haha and Ji Suk Jin challenged each other at the high jump and surprisingly Ji Suk Jin won. Yes, Ji suk Jin was lucky this time round and Haha was unlucky to hit the pole with his leg during the jump. After their encounter with the Kangaroo, their next mission is to look for the koala bear that matches the picture of the koala Bear card they are holding. Despite several tries, they got it wrong. Finally, Jae Suk team tried to get the hint from the zoo keeper. With some tricks, Jae suk managed to gather some clues and headed to the right direction to find the koala bear. 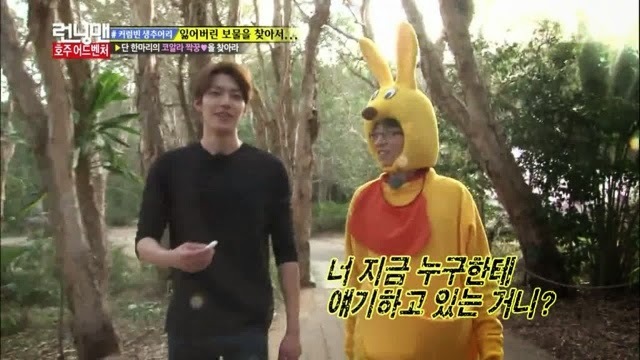 Jae Suk and Woo Bin found the koala bear and took picture of it. They emerged as the winner, therefore they could ask the questions about the cards. The Zookeeper explained that each Kola bear has different characteristics, therefore she could identify each of them. Their next stop is at the supermarket. They were given a list of groceries written in English. Rain was proficient in English and they completed their shopping fast enough to emerge in the first place. They set off to the next destination by car. They arrived in a villa resort near the sea and the house look so spacious. Rain behaved as though the house belong to him. The PDs said that Kwang Soo and Rain could ask them a question about the cards. Throughout the day when they were partners, they did not trust each other. Rain even suspected that Kwang Soo is going to betray him. Jae Suk and Rain team could ask one question about the cards and they had already guessed the cards they had picked. The rest of the teams arrived and the PDs asked the the winner team to switch partner for tomorrow mission. Rain picked Jong Kook as his partner to the protest of other members. Kwang Soo picked Woo Bin to the dismay of Jae Suk who had to pair up with Ji Suk Jin. Haha will partner with Gary for the missions tomorrow. The boys will rest in the villa for today but they must wake up at 5am and assemble at the entrance, the first team to reach will have an advantage. Playful Haha decided to play a prank on Ji Suk Jin. Both Haha and Kwang Soo distracted him and threw him down the swimming pool. Jong Kook heard the commotion and came out to check. He was targeted and was pushed into the pool too. Jong Kook exclaimed that he had only brought a singlet to Australia and now it is soaked with water. Now, it is payback time for Haha and Kwang Soo. Next in line was Gary, Jae Suk and Woo Bin. Their final target is Rain who by now is aware of this and tried his best to hide in one corner. However, Kwang Soo and gang discovers his hideout. They banged on the glass and disappeared when Rain turned around to check. That was really scarily and Rain soon realized that they had found him. They signaled for him to join them in the pool. Yes, Rain took out his clothes and jumped into the pool! The next episode, Ji Hyo will be back. I always like episodes that was filmed overseas. However, this Australia episode was a little boring. I think the interaction was a bit lacking because they have to travel from place to place. Nonetheless, I like the sceneries of Australia and enjoyed this episode. Since Australia tourisim sponsored this trip, I guess the Running Man have to try as much as they could to promote Australia.